It's been a busy couple of weeks around here. 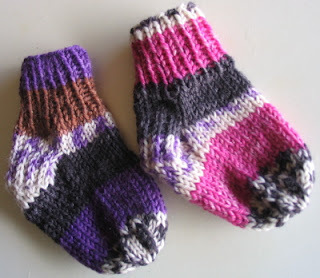 I finished up another pair of baby socks. This yarn has really long repeats, so when I finish one sock and start the next they don't always match! I'm still playing with the sizes, and other ways to make them fit better. 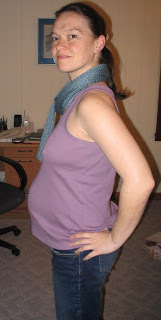 This is a combination finished knit and belly photo. This scarf is made from Berroco Soft Twist. It's a slipped stitch pattern that makes it roll up into a fairly tight tube. It's super long and wraps a few times around. The belly is self explanatory. This weekend marked the beginning of Sock Madness. Saturday morning around 130 people received a sock pattern by email. 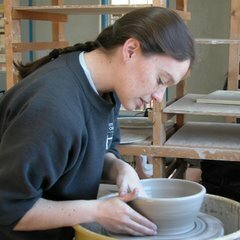 There are a lot of people who have finished the pair already and will move on to the next round. I finished my first sock this morning, I don't have much hope of staying in the competition, but I love this first pattern and hope to continue to knit up the patterns without the pressure. This is what we did this weekend that kept me from the sock. First we unearthed the 30 year old grapevines behind the house. They had been taken over by rose bushes and honeysuckle and the support wires had broken. 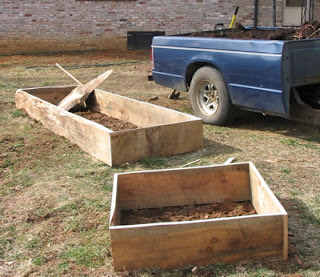 Then we built garden boxes in the front yard. We hope to build one more long one this week. Waiting there in the trailer is a ton of poop (literally), well aged and ready for plants. Back to my sock. Wish me luck. Good luck with Sock Madness. Those baby socks are SOOOOO CUTE. Cool about the garden boxes. I need some of those myself.